For all the load cells we manufacture for submerged applications, we pay special attention to their waterproofing systems in order to guarantee the degree of protection they require. With over 28 years of experience, we have tested and validated our load cells in the most extreme operating conditions. Their durability is due, in particular, to the special technique we use for the internal bonding of our strain gauges. For more than half of that period, we have been manufacturing submersible load pins for use in many different situations, such as operating in fresh water, testing in a controlled environment and carrying out measurements in the deep sea (> 1,500 m depth). Most of our load cells are available, as an option, in versions with an Ingress Protection (IP) rating of either IP66, IP67 or IP68. IP68 means being protected against complete and continuous submersion in the deep sea. Remotely operated vehicles (ROVs) – for tension control of the umbilical cable. As an option, all of our models can be supplied with an amplifier with an analogue, digital or completely specific output. 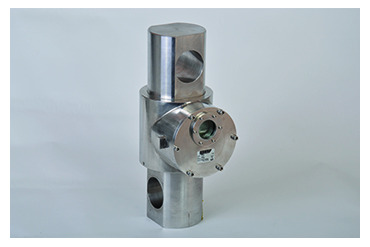 For example, we have designed a custom-made submersible load pin that combines an electronic measuring instrument with a battery and a display, enclosed with a pressure-resistant glass window and a volt-free contact switch.